Hooray! 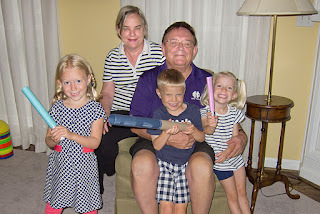 Grandma and Grandpa came to visit, and boy did we have fun with them! 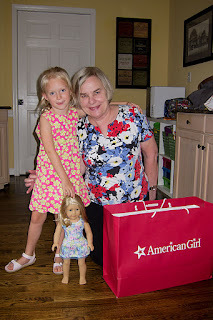 Grandma took CC on a lunch date to pick out her very own American Girl doll. CC picked #63, a doll that looks the most like her, and named her Kate. 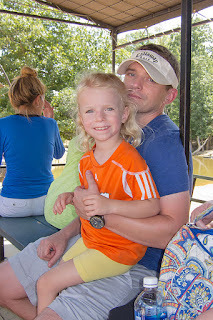 They have been inseparable ever since -- Kate even came to church with us on Sunday! 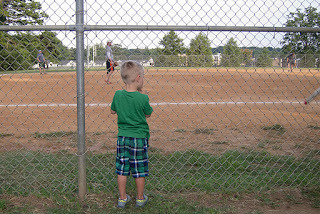 We watched Daddy play softball with his law firm league. The kids cheered him on very loudly as he came up to bat and got several good hits. 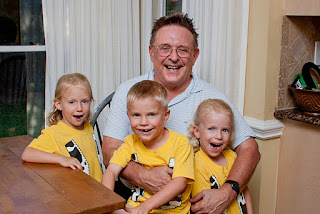 His games are usually at 8 pm, so the kids had never seen him play. 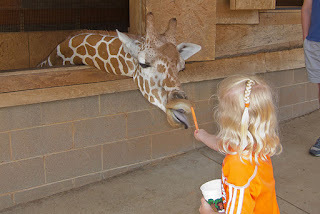 This was a rare treat for them and Grandma, too! 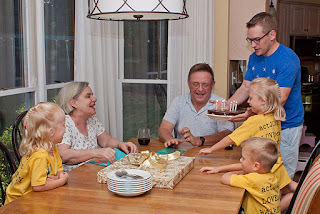 Grandpa joined us for the weekend, and we celebrated his 70th birthday. What a milestone! 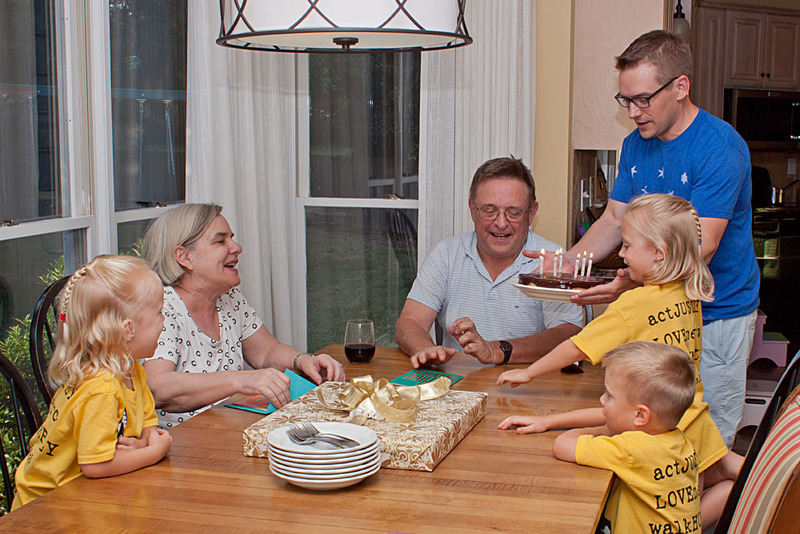 We also took the opportunity to celebrate Sweet Pea and Little Man's birthdays. 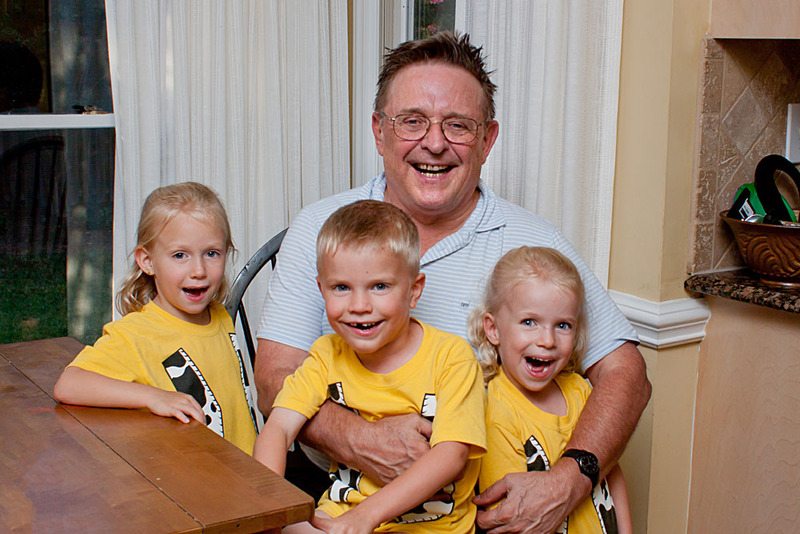 Grandma and Grandpa gave them each a special sleeping bag: Sweet Pea's is an adorable owl print, and Little Man's is outer-space themed. 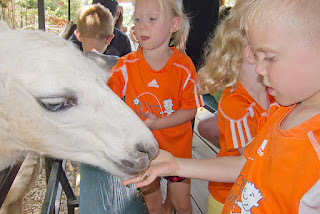 On Saturday we went to a small zoo, which had a decent selection of wild and farm animals. The kids had fun feeding carrots to a giraffe, and tossing food pellets to camels and goats. 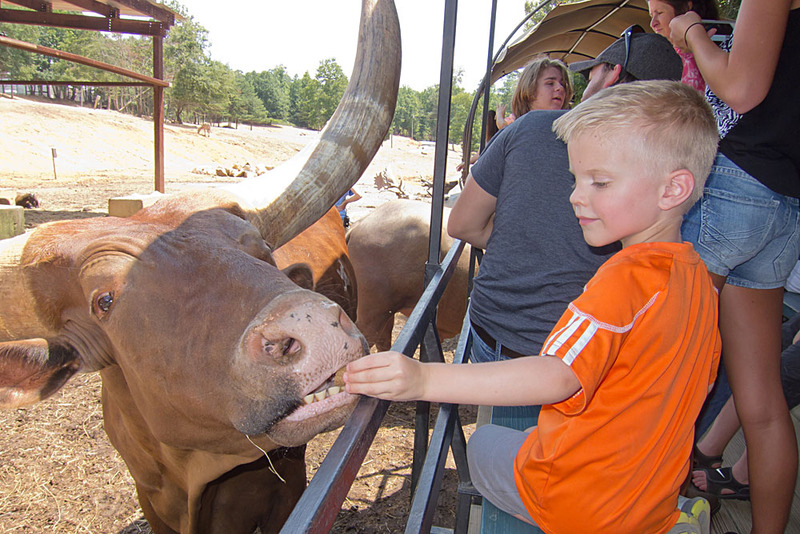 There was also a hayride so you could see and feed some of the larger animals. As usual, Little Man wasn't nervous at all, practically putting his hands directly into the mouths of water buffalo, alpacas, and a giant watusi bull with the biggest horns I've ever seen. The girls mostly threw the food at the animals, not wanting them to get too close. Little Man and Grandpa did a ton of wrestling (and at least one of them enjoyed it). We made light sabers and had Jedi wars. Grandma and Grandpa were well protected! Perhaps most exciting of all: Grandma and Grandpa took a real estate tour of the city while they were here. Maybe they'll move here one day?